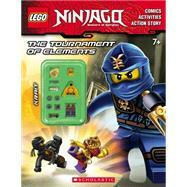 Join the four wise-cracking Masters of Spinjitzu on an exciting new adventure in this action-packed activity book! Inside you'll find games, puzzle, and stories based on the latest season of the hit LEGO Ninjago television show on Cartoon Network. Plus, this book includes a buildable Minifigure!